Jackie Orosz filled out a voter registration form while in line in Portsmouth, N.H.
WASHINGTON — The League of Women Voters of New Hampshire and three New Hampshire voters are suing to block a new state law that toughens voter registration requirements, part of a nationwide pushback against restrictions that advocates say are aimed at discouraging students, minorities, and other Democratic-leaning voters from going to the polls. The latest lawsuit, which was filed in a New Hampshire court Wednesday morning, challenges a measure GOP Governor Chris Sununu signed in July tightening the requirements for registering to vote in the state. Specifically, would-be voters must provide new documentary evidence, such as a driver’s license or utility bill, that New Hampshire is their place of domicile — or their primary home — and that they plan to stay for longer than a temporary stint. Supporters of the law, including New Hampshire’s secretary of state, say it is a necessary step to eliminate the possibility — and the perception — that the state’s voting laws are vulnerable to abuse by people who are in the state temporarily, with no intention of living there long term. “This is nothing more than political theatrics. We are confident the law will be upheld,” Sununu said of the lawsuit in a statement to the Globe. But civil rights advocates say the New Hampshire law’s true aim is to discouraging voting by groups that tend to favor Democratic candidates, especially college students. The law “sets up barriers to voting that are confusing, burdensome, and just plain arbitrary, and they will prevent the young and disadvantaged from having their voices heard by their government,” said Guy Cecil, chairman of Priorities USA, a major Democratic advocacy organization supporting the lawsuit through its nonprofit foundation arm. The New Hampshire filing is the second voting rights lawsuit Priorities USA has pursued this year. The first was filed in Indiana earlier this month and seeks to block consolidation of polling places in a heavily African-American and Latino precinct. “More to come very soon!” Cecil tweeted Wednesday. The New Hampshire Democratic Party filed a separate lawsuit against the new voter registration rules Wednesday, making similar arguments in favor of blocking the law. “New Hampshire Republicans have created a solution to a problem they have no evidence exists,’’ said the party’s chairman, Ray Buckley. Critics say the New Hampshire law is part of an uptick in state legislative efforts to restrict voting in the seven months since Trump took the White House. Many civil rights advocates say it’s no coincidence, given the repeated unsubstantiated claims Trump made both before and after his electoral victory about rampant voter fraud in New Hampshire and other states. “Most certainly this president has fueled voter suppression efforts,’’ said Kristen Clarke, president and executive director of the Lawyers’ Committee for Civil Rights Under Law. Since the beginning of this year, at least 99 bills that would restrict access to voting or voter registration have been introduced in 31 states, according to the Brennan Center for Justice at New York University School of Law. Of these, 35 bills in 17 states saw legislative action — gaining approval at the committee level or beyond. The total of bills moving through or passing state legislatures so far in 2017 is more than the previous two years combined, said Jonathan Brater, counsel for the Brennan Center’s Democracy Program. Voting rights advocates are particularly disturbed by the Presidential Advisory Commission on Election Integrity, which Trump created to investigate alleged voter fraud around the country. The commission itself has been hit with numerous lawsuits, and critics say it is stocked with biased members with long histories of making exaggerated claims about voter fraud or using their offices to enact voting restrictions. “There is a concern that whatever document, report, finding the commission makes, particularly if they exaggerate the extent of the problem of illegal voting — which there’s good reason to be concerned that they will — could be used as a tool to justify measures to make it more difficult to vote,” said Brater. New Hampshire Secretary of State Bill Gardner, one of the defendants named in the lawsuit filed Wednesday, is a member of the presidential panel. The plaintiffs in the New Hampshire lawsuit argue that the law aims to suppress voting by groups, especially college students, who tend to favor Democratic candidates. 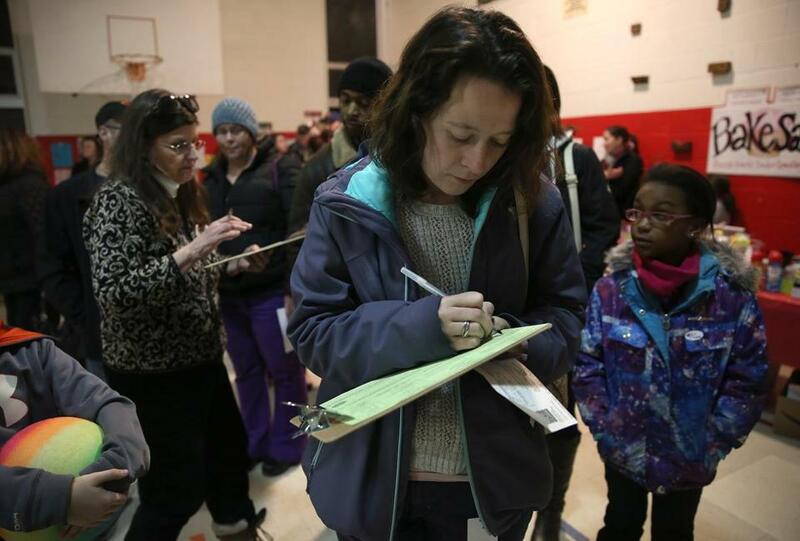 Under the new law, people registering within 30 days of an election — or at the polls on Election Day, under New Hampshire’s same-day registration provision — could still go ahead and register if they lack the necessary documents. But they have to sign an affidavit promising to turn over proof of their plans to live in the state long term within as few as 10 days. Those who can’t or don’t provide proof in the allotted time could be subject to investigation by state or local officials, including the possibility that local police or other officials would go to their listed addresses to verify they live there. The complaint cites figures showing how college students in New Hampshire overwhelmingly vote Democratic, arguing that the registration law’s true aim is “suppressing the young vote for political gain and not in furtherance of any legitimate purpose.” The plaintiffs include a Dartmouth College student from California and a University of New Hampshire student whose family is elsewhere in the state, both of whom say they consider their campus addresses their true places of domicile. In addition to Gardner, the suit names New Hampshire Attorney General Gordon MacDonald as a defendant. Top New Hampshire officials have defended their law as a reasonable measure to boost confidence that the state’s elections are fair and secure. “This legislation helps protect the integrity of New Hampshire’s electoral process. As host of the first in the nation primary, New Hampshire has the obligation to ensure our system is beyond reproach,” Sununu said in June when the bill passed the New Hampshire House. Neither he nor Gardner could be immediately reached for comment. The bill’s lead sponsor, GOP state Senator Regina Birdsell, told the Globe she has “consistently heard concerns from my constituents related to voter integrity since I first ran for state representative in 2010.” In a February interview, she recounted constituents telling her they’d seen “cars from Massachusetts” coming into polling places on Election Day — claims similar to those Trump made after the election. On Wednesday, Birdsell said Gardner had told her there have been “confirmed cases of voter fraud” in the state, and “when so many elections in the state of New Hampshire come down to just a handful of deciding votes, even one case of voter fraud is too many.” Gardner has said he does not believe there was widespread voter fraud in New Hampshire.